The Freight presents an evening of soul stirring, passionate music from Galicia, performed by a troupe of West Coast folk musicians led by “Cano” Cadarso, a master teacher visiting from Santiago de Compostela. This performance marks the culmination of a week of intensive study in the intricacies of Galician music and dance. 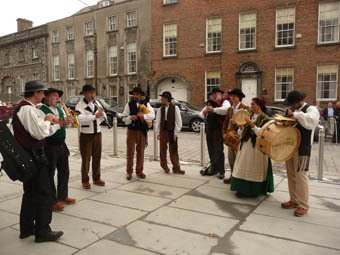 Musicians will play gaita (Galician bagpipes), requinta (flute), zanfona (hurdy gurdy), and the percussion instruments bombo, tambor, and pandeireta, as well as fiddle and mandolin. They will perform a treasure trove of Galician music old and new, including muiñeiras, xotas, foliadas, golpes, and alalás, as well as traditional Galician folk songs, including some taken from the repertoire of the legendary blind street fiddler, Florencio dos Vilares. The evening will feature various combinations of musicians and dancers, from duos and trios to the large and thrilling massed pipe band. The Association of Gaiteiros Californios is a wild coalition of musicians – or a coalition of wild musicians – dedicated to the music of Galicia – the green, mysterious, ancient province in the northwest corner of Spain. In Galicia, bagpipes have been played for over a thousand years, and traditional music is a part of everyday life, its rhythms woven into the language and architecture, and its songs sung everywhere. Musicians will include Cano Cadarso, renowned for his contributions to such bands as Verdegaio, Resonet, and Berros de Castro, as well as for his teaching, and some of the West Coast’s most experienced and talented players, including members of the Brunos Band and Wake the Dead.